We offer a FREE pick-up and delivery service for all vehicle we service in the Northampton area. It's always nice to get something for free, so we'll provide FREE fitting for any wipers and bulbs that you may require while your vehicle is with us. If your vehicle needs a spring clean while it with us we offer you a range of valet services so it's spick and span ready for your collection. If for any reason you can’t get through to us, simple enter your details below and we’ll get back to you as soon as possible. P J Hodge & Sons is an independent family-run business. At the helm is the founder Peter Hodge and his son Oliver, who together, have over 40 years experience in the motor industry. Peter started with Mercedes-Benz and has also worked for Porsche, VAG (Volkswagen Audi Group), Vauxhall and Rolls Royce. P J Hodge & Sons is also one of the few garages qualified to work on Aston Martin cars. "From our early days when we operated from a small workshop, we’ve grown into a mature business that now caters for a wide range of premium, performance, fleet and lease vehicles from our Northampton base. We take great pride in investing in and using the very latest equipment, new technologies and servicing techniques. This enables us to offer car servicing excellence and value through our fully trained and accredited technicians. Above all, I believe we’re big enough to offer the sophisticated dealer-standard diagnostic equipment and technical resources that car owners demand. But we’re also small enough to offer a high level of service and personal attention our customers have become accustomed to. In fact, we treat all of the cars that we look after as our own. And as a tiny example of this, we’re happy to collect and deliver your vehicle if required, so you don’t have to interrupt your busy schedule." At P J Hodge & Sons, we like to think of ourselves as the 'better garage'. Come to us and you’ll quickly find that the value is in the detail, not just the price. We’ll look after your vehicle as if it was one of our own. We’ll give you a more complete service, looking after the whole vehicle. We can provide a pick-up and delivery service. We’ll even provide free fitting for replacement wipers and bulbs. Above all, we look to build long-term relationships with all of our customers, by offering a first class service at an affordable price. 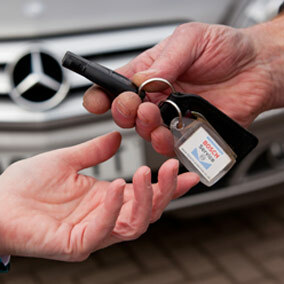 Bosch Car Service approved - your guarantee of quality service, value and total peace of mind. 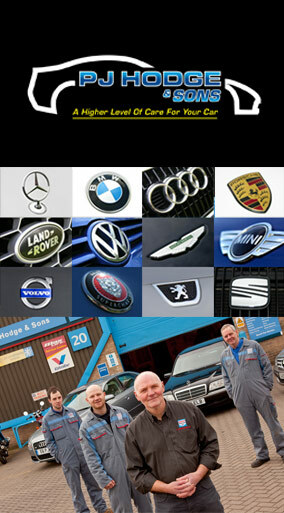 We are part of the Bosch network of approved car service garages. This means we are regulated by Bosch and must take part in a programme of regular quality and performance checks to adhere to the Bosch Car Service Code of Practice, so you can be certain of the highest standard of quality and service. What does Bosch Car Service mean to you, the customer? Bosch Car Service garages provide vehicle maintenance, repairs and diagnostics for all makes of vehicles. We guarantee a first class service at an affordable price. Our technicians are trained on the latest technologies and have the most up-to-date diagnostic equipment to pinpoint any faults in your car as quickly and accurately as possible. Any parts that need to be replaced will be of the same quality as those that were originally fitted on your vehicle. The Bosch Car Service network works to an Office of Fair Trading approved Consumer Code of Practice. This commitment to customer care gives you peace of mind in knowing that you are going to be given not only the best technical service, but also the best customer service. 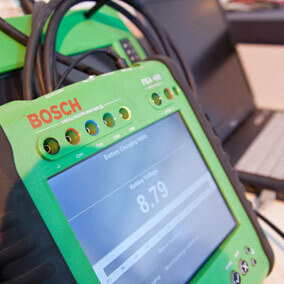 The Code sets out the standards and practices of a Bosch Car Service garage so that you can make an informed and favourable decision as to the suitability of the services on offer. All Bosch Car Service garages are required to comply with the provisions of the Code and fulfil all relevant statutory and legal requirements, in particular those relating to Trading Standards, Health and Safety, Environmental Protection and Employment. All Bosch Car Service garages aim to offer an outstanding level of care and attention, as well as the highest standards of workmanship. Bosch Car Service customers are invited to fill out customer satisfaction surveys providing feedback on the service they receive at their Bosch Car Service garage. 98.2% said the garage clearly explained the work needed before carrying it out. 96.7% said that their vehicles were ready for collection within the time agreed. In all, 99.7% said they were happy with the service they received. Our highly skilled service technicians are one of our most important assets. That’s why we do everything we can to ensure that they are up to speed with all of the latest innovations, technological developments and refinements to the range of cars that we work on. Our team of technicians regularly update their skills and knowledge by going on training courses throughout the year. 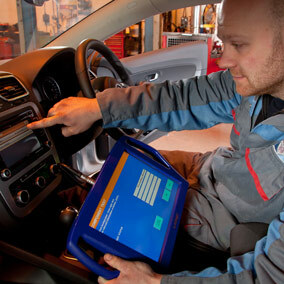 At the heart of our entire car servicing operation is our fault diagnostic equipment. It is, quite simply, the most sophisticated diagnostic solution available anywhere on the market. Almost all modern vehicles have complex electronic control systems, so this type of advanced equipment is essential in helping us to diagnose faults and increase the performance and economy of your car. Our diagnostic system combines dealer-level software with unrivalled technical support from master technicians and specialist software engineers. It gives us the advanced equipment, technical resources and confidence to carry out any car service, diagnostic, fault finding and repair work necessary, without having to involve the dealer or call in outside help. Our diagnostic solution is a genuine alternative to the manufacturers’ own systems and can provide even quicker diagnostics, coding and programming. The system is updated with new information daily and our own team of technicians take part in continuous training and development courses throughout the year. They see all of the common faults and problems that dealers are experiencing and they know how to fix them. In short, their vehicle knowledge is second to none. Best of all, just because we have and use have dealer-standard diagnostic tools, it doesn’t mean we charge dealer level prices. Many people mistakenly believe that if you have your car serviced at any garage other than the main dealer, then the manufacturer’s warranty will be invalidated. Not so. If we carry out any work on your car during a service, we will always use original manufacturers’ parts, so your warranty will be completely unaffected. We also offer a high standard of car servicing for fleet and lease cars. As we are VAT registered and Bosch Car Service approved, we are qualified to service fleet cars. 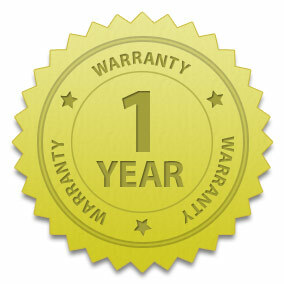 And we can also carry out servicing on lease cars without invalidating the manufacturer’s warranty. In fact, we take care of the services on a number of vehicles from their very first one, mainly because of the high quality of our technologically advanced diagnostic tools. Indeed, we actually handle the fleet servicing for one of the major leading high street banks. As you know, regular servicing at the recommended intervals as well as the stamped documentation as proof of its history will all help to ensure the value and reliability of your vehicle. Naturally, we offer a full 12 months parts and labour warranty on all work we carry out, to give you additional confidence and peace of mind. If for any reason you are unhappy with any aspect of the service you’ve received from P J Hodge & Sons, please return to the garage so that we can rectify the issue as quickly as possible. P J Hodge & Sons Limited is in no way affiliated with or a representative of any of the vehicle manufacturers mentioned in this website.